Built in 1893, the Littlefield house was the former home of one of UT’s most renowned donors. From a slaveholding family before the Civil War, George Washington Littlefield went on to become a confederate officer, cattle baron, and banker. His fortunes, politics, and vision helped build the campus. He constructed his home across the street from the original 40 acres and it serves as the first stop on the tour. In this segment we learn about Littlefield’s rise to power and wealth, as well as how he and other powerful Texans left their imprint on the University. Currier & Ives, “Westward the Course of Empire Takes Its Way,” University of Washington, 1868. “Historic photo of a longhorn herd near Deanville, Texas,” Bob Bullock Museum. “George W. Littlefield,” Wikipedia, 1 Jan. 1911. [Littlefield Building Photograph #1], photograph, [1915..]; (texashistory.unt.edu/ark:/67531/metapth496729/m1/1/: accessed February 28, 2019), University of North Texas Libraries, The Portal to Texas History, texashistory.unt.edu; crediting Texas Historical Commission. “Rath & Wright’s Buffalo Hide Yard,” Pique Show, 1878. “Two Men Pose With a Mountain of Bison,” Pique Show, 1870. We’re standing in front of Littlefield Mansion, opposite the original 40 acres of the University of Texas. If you look at the double row of oak trees, that run up and down 24th Street here and then down Guadalupe, and then down 21st Street, and then up Speedway, what’s contained within that double row of oak trees is the original 40 acres. This was the land seeded by the City of Austin and decreed by the state legislature to be the campus of the University of Texas at Austin. It was created by the legislature to be a university of the first class. It was placed here on top the highest hill overlooking Austin coming up from the river. George Washington Littlefield established this mansion here in 1894, but the university itself was established in 1883, around the same that Littlefield originally took up residence in the city. It’s interesting to think a little bit about the time and events that brought Littlefield to this spot and that also led to the creation of the University of Texas. George Washington Littlefield was born originally in Mississippi, he and his family moved when he was nine to a plantation just outside of Gonzales, Texas. There they set up a number of cotton plantations, Littlefield himself was the owner of two such plantations by the time he was a teenager, and was the owner of a large number of enslaved people. When the Civil War started, Littlefield joined the Confederate Army, was signed as an officer, got injured, and then was made a major. For the rest of his life he was known as Major Littlefield. At the end of the war, Littlefield tried to go back to farming cotton, but found it difficult both because he didn’t have the enslaved labor necessary to make it work, but also because of the boll weevil and other natural problems. Littlefield as a sidelight had run cattle on his plantation. He began to expand that cattle herd until it became the basis of what was to become enormous wealth in the following decades. Sometime in the 1870s, he expanded his cattle operation in Central Texas, and actually owned land just south of here in Buda. Eventually he owned a vast amount of territory up in the Texas panhandle, and then subsequently he owned a large area in West Texas, and eventually a huge chunk of New Mexico where he ran longhorn cattle. Littlefield’s wealth and his geographic movements are closely coordinated with the expansion of the United States, and both the human and ecological changes that the expansion of the United States signified after the Civil War. In other words, when the Union Army was engaged as an army of occupation during the reconstruction period here in Texas, it was at the same time undertaking the expansion of the United States as a country westward. If you think about it, by the beginning of the Civil War, San Antonio, Austin, and Waco marked the frontier, the Western Frontier in Texas, with Native Americans occupying most of west Texas. So right after the Civil War, the Federal Army began to push west. In pushing west, it eliminated the indigenous populations that have resided there. An enormous industrial machine pushed that westward expansion. The industrial infrastructure that was behind the North’s victory in the Civl War, turned towards industrial production of commercial goods. One of the major features of this industrial expansion was the railroads. So at the same time the Federal Army was moving west and taking more and more territory from Native Americans, the railways were following. 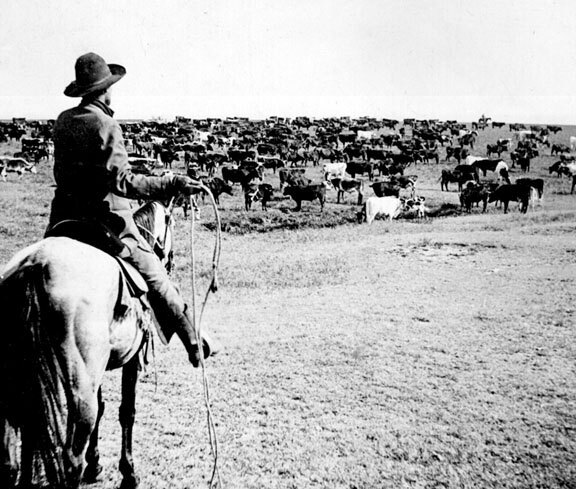 Littlefield took advantage of this dual expansion, grazing his herds and land previously occupied by Native Americans and shipping them east on the railways after driving them north to Kansas. That scenario was enhanced by one other factor, as the nation pushed west in front of the railroads, frontier folks arrived adventurers, hunters, cattlemen, tourists, and began the massive destruction of the bison herds, which were in the tens of millions before the Civil War and were reduced to almost nothing within the next 30 years. Littlefield took advantage of this massive ecological transformation of the plains, the decimation of bison herds left so-called virgin grassland that could be used by people like Littlefield to graze their longhorn cattle. 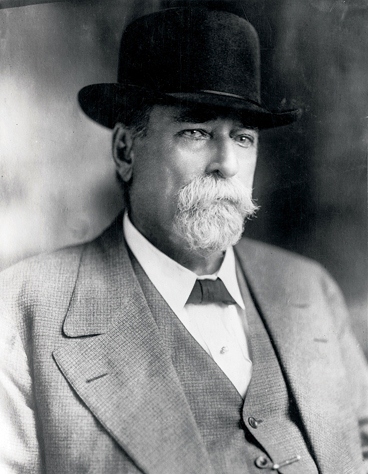 By the time we get to the 1880s and 90s, Littlefield was a cattle baron and one of the richest people in the country. All made on the backs of longhorns. So it’s very fitting that the University of Texas’s mascot is a Longhorn as much of the wealth that created the university came from the cattle industry. Although this is problematic when you think of the ways in which the wealth that Texas was built on the annihilation of Native Americans, the decimation of buffalo, and the expansion of industrial capitalism into the West, we still love our Longhorns. Littlefield, having made his fortune in cattle ranching, came to Austin in the 1880s and early 1890s. He opened up a bank, he opened a hotel, he built this mansion, he became a regent of the University of Texas in due time. And the University of Texas became one of his abiding political and philanthropic interests as well, that’s going to be of importance when we take this tour across campus. The Littlefield Mansion was his final home and one of his crowning joys. The service people who work in the building have reported to me that there are slave quarters in the basement. That’s not really possible because we know the Littlefield Mansion was built in 1894, well after the end of slavery. But we also do know that Littlefield employed many of his ex-slaves, particularly his manservant, Nathaniel Stokes, who lived to be 104 and who wept over his grave. So these are not slave quarters, but they may be the quarters of ex-slaves who were servants in the Littlefield Mansion. So now, given that history, and actually a few tidbits more, if you look around you, to the right and to the left, this Littlefield Mansion was built in an area that, soon after its construction became a choice place for rich and upper middle class folks to build their homes. It became a very high-class residential area, and that’s going to be important for some of the things we’ll discuss in the future. So we’re going to now walk across the street and we’ll pay special attention to both what we see and what we don’t see. We’re going to think about why it is that the spaces are constructed the way they are. Why it is that other spaces don’t have particular kinds of structures in them, we’re going to think about the kind of architecture that we see in the buildings, but also the kind of landscape architecture that we traverse. 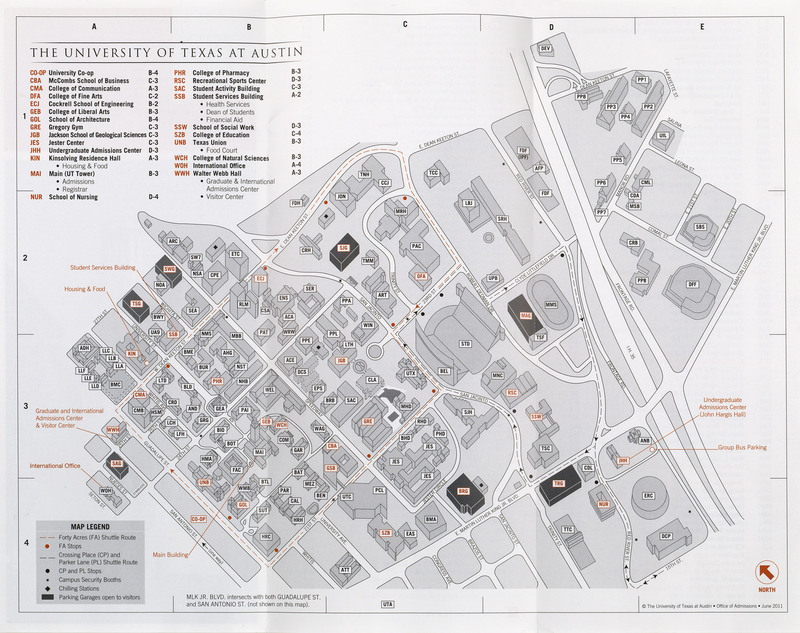 We’re going to think about building names, we’re going to think about building shapes, we’re going to try to relay those things to the history of the University of Texas and specifically to the racial geography that’s built within ’em.